Christmas Eve is steeped with tradition in our family. The Italian meal of the seven fishes along with pasta, of course, makes for a mouthwatering evening. And then there’s guitar playing and Christmas carol singing and, most importantly, tracking Santa in his travels around the globe. The excitement builds though out the night as the kids keep gathering around the laptop (yes, there’s an app for tracking Santa; gotta love modern technology!) to check on Santa asking “Where is Santa now? Is he getting closer? When will he be here?” They gather round and listen intently to a reading of ‘Twas The Night Before Christmas and then excitedly run back to the laptop to check on Santa’s travels. And of course, we cannot forget the most important reindeer of all guiding Santa’s sleigh to every girl and boy’s house. Rudolph the Red Nosed Reindeer, the most famous reindeer of all! So it only seems appropriate to end the evening with Reindeer Brownies, a homemade brownies recipe, as the anticipation of Santa’s arrival builds! 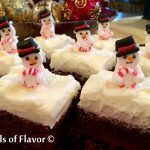 Homemade fudgy brownies topped with a silky-smooth cocoa buttercream frosting come to life as Rudolph when cut into triangles and decorated with sugar eyes and your favorite candy! Last month my brownies were Turkey Brownies and this month they are Reindeer Brownies! I just go with the flow of the holidays around here! Wishing you Happy Holidays and treasured traditions for you and your family too. In anticipation of Santa’s arrival, we always make Reindeer Brownies for our Christmas Eve dinner dessert. 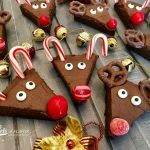 Reindeer Brownies have become a delicious tradition for our family and I hope for your family too! 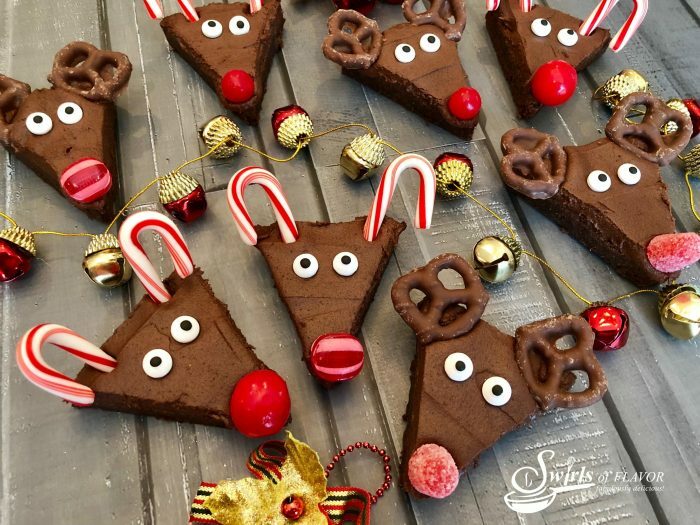 So why not begin by making delicious memories with Reindeer Brownies? 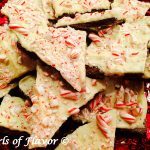 No-Bake Peppermint Bark Cookies are a twist on a holiday favorite! 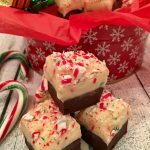 White chocolate surrounded by peppermint candy and chocolate cookies are guaranteed to be a hit on your holiday table! And so easy to make as a last minute sweet treat! 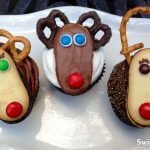 Homemade fudgy brownies topped with a silky-smooth cocoa buttercream frosting come to life as Reindeer Brownies with sugar eyes and a bright red candy nose! Preheat oven to 350F. Line a 13-inch x 9-inch baking pan with foil leaving a 2-inch overhang. Coat with non-stick cooking spray. In microwave-safe bowl, melt 1 cup butter. Stir in sugar until dissolved. Add eggs and vanilla, stirring until blended. Stir in flour, 1 cup cocoa powder and salt until a batter forms. Spread evenly in prepared baking pan and bake 30 minutes or until a toothpick inserted in center comes out clean. Cool 15 minutes in pan. Using foil overhang transfer brownie to wire rack and cool completely. Meanwhile, beat 1/2 cup butter until creamy. Combine confectioners' sugar and 2/3 cup cocoa powder in bowl and whisk until blended. Reduce mixer speed and gradually add confectioners’ sugar mixture until blended. Add milk and beat until creamy and smooth. Spread frosting over top of cooled brownie. Cut brownie horizontally into three sections. Cut each section into 8 triangles as shown above. There will be small brownie scraps on ends of each sections. Feel free to snack on those! Decorate each triangle with two candy eyes, two antlers and a red nose and watch as Rudolph comes to life!